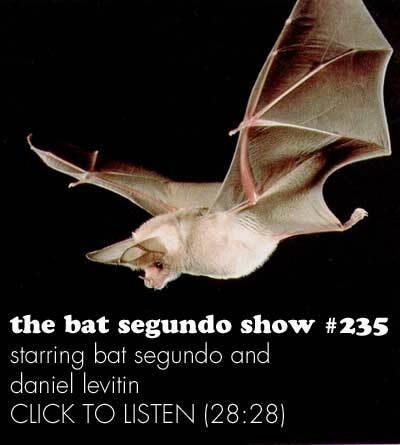 Daniel Levitin appeared on The Bat Segundo Show #235. 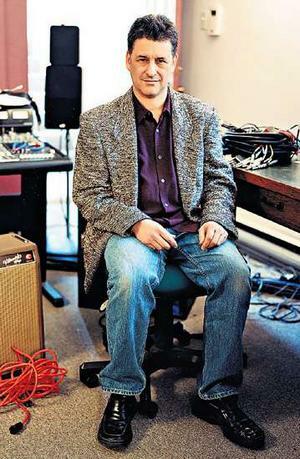 Levitin is most recently the author of The World in Six Songs. Condition of Mr. Segundo: Recalling a traumatic musical episode from his marriage. Subjects Discussed: Songs that straddle multiple categories within Levitin’s taxonomy, neurological response vs. societal perception of a song, the original eight categories, oxytocin, “I Walk the Line,” Nine Inch Nails, hypothetical subspecies of comfort songs, angst and emo, Janis Ian, social comparison theory, joy songs and advertising jingles, chemical levels rising in relation to specific musical genres, serotonin levels and music, cortisol, responding to Steven Pinker’s “auditory cheesecake” controversy, Steven Mithen’s The Singing Neanderthals, the evolution of language and music, David Huron’s “honest signal” hypothesis, attempts to predict hit music, advertising and music, insincere pop music, smart audiences, the pernicious use of music, the use of Van Halen’s “Panama” to get Manuel Noriega out of his bunker, music used to torture people in Abu Ghraib, and using music in ways that it wasn’t originally intended. Correspondent: We have six categories. Can you name a single song that can be applied for all six categories? Have you considered examples along these lines? Levitin: I’m sure if you gave me enough time, I could. Levitin: (laughs) Well, I’m going to go with “I Walk the Line.” Because I think it’s a very rich song. In the book, I make the case that it crosses two categories. Correspondent: It really walks the line here. Levitin: Right. At the surface level, I believe that it looks like a love song. A guy singing to the woman he loves, “Because you’re mine.” There’s a “you” in it. “Because you’re mine / I walk the line.” I’m not cheating on you. But the point I make in the book is that really I think at a deeper level, he’s not really singing it to her. He’s singing it to himself. It’s like a musical string around his finger reminding me of all he has at stake here. “I find it very, very easy to be true / I’m alone when each day is through.” I don’t think so. I don’t think you’ve been alone every night. And I don’t think that you find it that easy to be true. I mean, I think it’s a struggle. And he’s reminding himself of all that he has at stake. That’s a knowledge song. Self-knowledge. Now at the same time, I think that you can argue that there’s an element of comfort here. People who have been in a similar situation take comfort in hearing it expressed this way. I listen to music often because the songwriter helps me to understand feelings that I haven’t been able to articulate. The right song comes on. Aha! That’s how I feel. And I find that comforting. Correspondent: I’m wondering also if identifying song by the six categories is a matter of identifying perhaps a dominant and a recessive category for each particular song. Perhaps a stronger song is more likely to have at least two categories attached to it. Or maybe some songs are utterly simple and just intended to serve one purpose. I mean, it all depends on any number of factors. Maybe you can talk about this a little bit. Levitin: Well, I think the other aspect of it is that it’s not that the songs themselves fit into six categories. It’s that these are the six ways that people use music. The six ways that people have had music in their lives. The six ways that they use to communicate with one other. Correspondent: I wanted to ask you about comfort songs. You cite specific personal examples. But I wanted to give you a personal example that I had as a teenager. I had a tendency to blast Nine Inch Nails quite loud. It was a comfort song to me largely because I would listen to this man who was utterly depressed. And I’d say to myself in a sad state, “Oh, you know, there is someone who is worse off than me.” And it was a way for me to corral my emotions with reason. However, the examples that you use in the comfort chapter tend to be people who are looking just for emotional comfort, but not this association between reason and emotion. And I was wondering if it’s very possible that we could be talking about two subspecies of comfort songs. Levitin: What do you mean? The connection between reason and emotion? Levitin: Kind of like listening to Morrissey. Correspondent: Any of the emo. Correspondent: Yeah, exactly. I mean, should we draw two types of distinctions in comfort songs along these lines? I mean, we have to factor in emo. We just do.